What good is wiping down the counter if your sponge or dishrag has had mold and bacteria growing on it for days? Debbie's solution? A unique GeniusSponge that helps inhibit growth of bacteria and mold on the sponge itself, while reducing the potential for it to spread elsewhere. Add in a scrubber surface on one side and you have a powerful ally in your fight against tough grease and grime too. More absorbent. Longer lasting. Genius. these are the most luxurious sponges ever. i don't have a dishwasher, so sponges are important in my household. they work better than anything else i've used, and they never seem to look bad. i only know to throw them out when they get malodorous. this set of 12 will probably last well over a year. i keep buying more because i end up giving them away. Purchased over a year ago on HSN. Best sponges we have ever had and we've been married 50 years! Gave some to our sons and they love them. You're gonna be glad you got them! 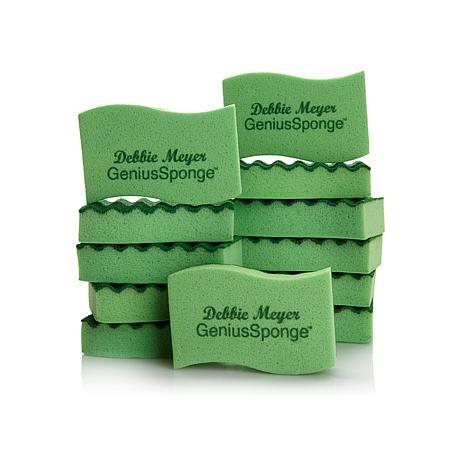 LOVE THESE SPONGES.THEY NEVER SMELL AND CLEAN VERY WELL. 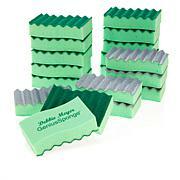 These are the best sponges I have ever used. They don't carry any odors and rinse clean every time. I am stocking up on these so I always have on hand. 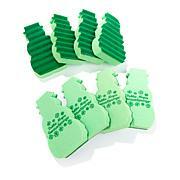 Keep in mind we have to trust these are truly germ free, these make cleaning up effortless. From counter to dishes. I use less soap as it remains soap too. And simply throwing them in dishwasher for cleaning? Yes!! Never was a fan of washing used dish clothes with my regular clothes/towels. 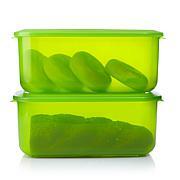 I have been using one for almost 2 months and no wear or tear. I will probably have these til I die.